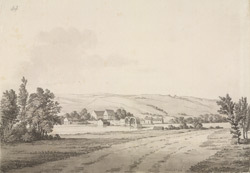 A view in ink of Hexham in Northumberland, and of the bridge being erected there in 1778. Popularly known as the Capital of Tynedale, Hexham was the county town of Hexhamshire for some 300 years, until Queen Elizabeth annexed it to Northumberland in 1570. Hexham abbey dates from the seventh century, and retains its Saxon-era crypt. At the time Grimm made this drawing, Hexham was one of England's leading leatherwork centres.